Blackberry recently launched their new physical keyboard Android powered smartphone Blackberry Keyone in different regions and was like in all those regions. Blackberry was already rumored to launch a new smartphone with Android this year and its rumored to be code named BlackBerry Krypton. The new Blackberry handset has now received the FCC approval in the US and confirmed the battery size of the device. 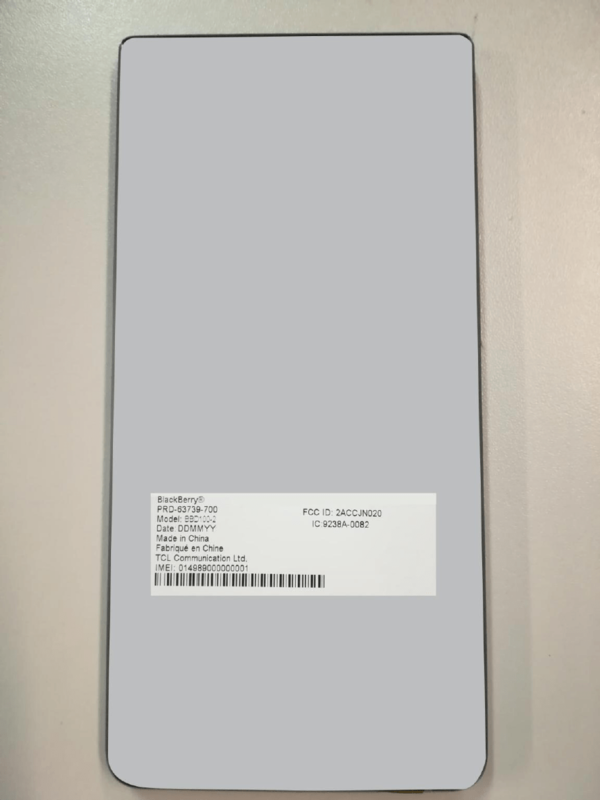 The Blackberry Krypton is listed at FCC with the model number BBD100-2 and the listing has confirmed that this new device will be powered by a 4000mAh battery if we look at one of the documents available inside the FCC approval documents. Another file from the documents comes with an image of the rear side of the device itself. The Blackberry Krypton is expected to comes with an all touch display and is expected to feature a Full-HD display with 1920X1080 pixels resolution but we still don't know what will be the size of the device screen will be. It will be powered by a Snapdragon 625 or the Snapdragon 626 processor. It will have 4GB of RAM and will have 32GB or 64GB of inbuilt storage capacity. It will be powered by a 4000mAh battery as we have confirmed it from the FCC documents, it will carry different connectivity options like 4G LTE with VoLTE, Bluetooth, 3G, GPS, WiFi and other standard connectivity options as well. The device will have a front facing physical home button that will have an embedded fingerprint scanner. The device will be having a IP67 certification rating making it a waterproof smartphone. Other details about this device are currently unknown and we will have more details about the device in its future leaks. The Canadian company launched the Blackberry KeyOne recently that features a 4.5-inch display with 1620 x 1080 pixels resolution, 433 PPI and a scratch-resistant glass protection. It is powered by a 2GHz octa-core Snapdragon 625 14nm processor with 650MHz Adreno 506 GPU along with 3GB of RAM and 32GB internal storage capacity with MicroSD card expandable storage up to 2TB. It comes with a 4-row physical QWERTY backlit keyboard with capacitive touch and runs on the Android 7.1 (Nougat). It features a 12-megapixel rear camera with dual-tone LED Flash, Sony IMX378 sensor, 1.55μm pixel size, 1/2.3″ sensor size, f/2.0 aperture, PDAF, 4K video recording along with an 8-megapixel front-facing camera with 1.12µm pixel size and f/2.2 aperture. Other specs of the device includes a 3505mAh battery with Qualcomm Quick Charge 3.0 that can deliver up to 50% of charge in just 36 minutes. A fingerprint sensor is available on the space bar of the QWERTY keyboard and it comes with a 3.5mm audio jack and with FM Radio support. It measures 149.3 x 72.5 x 9.4mm and weights 180 grams. it comes with connectivity options like 4G LTE, Wi-Fi 802.11 ac (2.4 & 5 GHz), Bluetooth 4.2, GPS / GLONASS, NFC and USB 3.1 Type-C.